This SharePoint tutorial explains, how to embed a PowerPoint slide using SharePoint classic and modern experience using SharePoint 2019/Online. The same way also we can embed PowerPoint slide in SharePoint 2013/2016. Here we will embed the PowerPoint slide in both SharePoint classic page and modern pages. Step 1: Create a PowerPoint in your local computer or Office online. Step 2: Create a document library in SharePoint. You can find the link here how to create a document library in SharePoint. Step 3: Upload that PPT file inside this document library. Step 4: Next open the PPT file and go to the share option to generate the Embed code. Please look into the screenshot below. 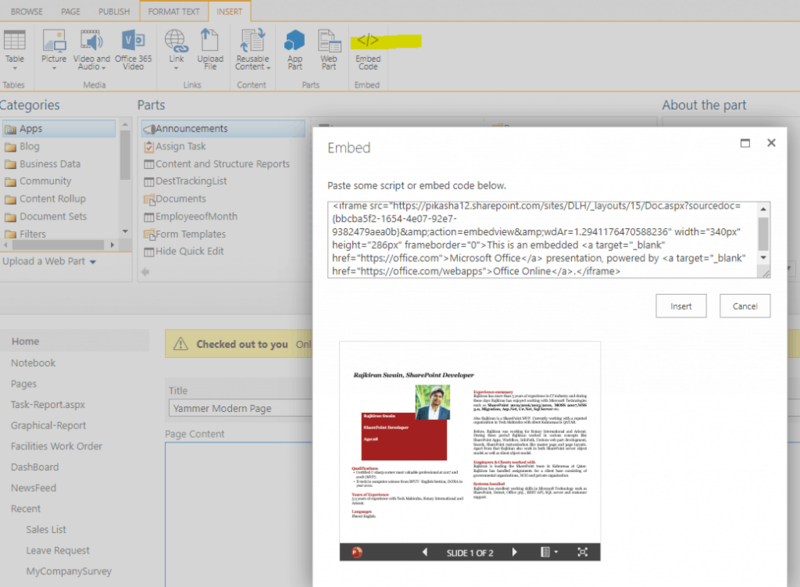 Step 5: Copy the embed code and paste it inside in your SharePoint page. You can also set the dimensions of the slide. 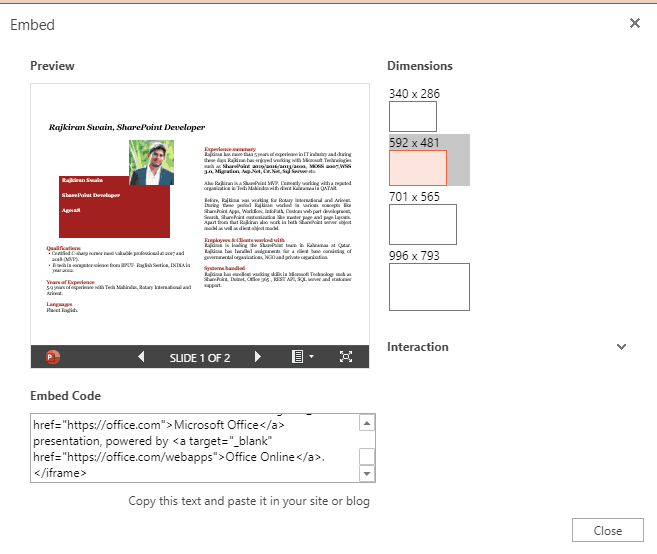 Step 6: Create a SharePoint classic page and Edit the page and click on Embed on top of the page. Next paste the same embed code. You can also copy the code from here. Step 7: Once you click on Insert and save the page, the slide will be appear in your SharePoint page. Step 8: We can also use the same embed code in SharePoint modern experience. Step 9: Click on the Embed, Next copy and paste the same code. next slide will appear in your modern page in SharePoint. We can also integrate same embed code inside a list in modern view in SharePoint. Hope this SharePoint tutorial explains, how to embed PowerPoint presentation in SharePoint online/2013/2016/2019. We can embed PowerPoint slide in SharePoint classic and modern pages.